If you're looking for the perfect "bugly" entomological gift, be sure to stop by the Bohart Museum of Entomology, University of California, Davis. The Bohart Museum, located in Room 1124 of the Academic Surge Building on Crocker Lane, is open to the public Mondays through Thursdays except on holidays. It will be closed Dec. 21 through Jan. 6. It's directed by Lynn Kimsey, professor of entomology at UC Davis. 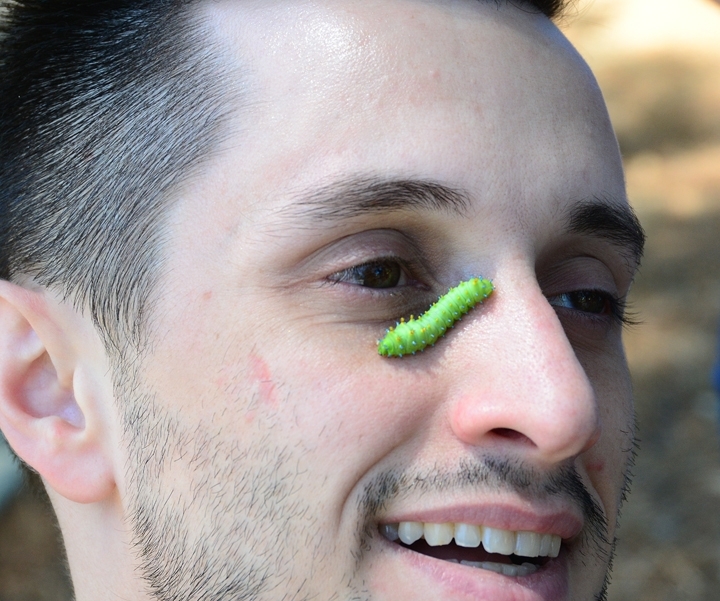 Here are some of the ways you can think entomological! Donate to the Bohart Museum Society. Thanks to public support last year, "we have created internships for high school students, expanding our K-12 outreach programs, incorporated newly donated collections of beetles and butterflies and have two awesome imaging systems that have made it possible for us to provide Bohart Museum scientists and visiting researchers with high quality images of insects in our collections," related Kimsey. "We have big plans for the coming year and your continue support will make it possible for us to add a second session to our summer camp for junior high students, train undergraduate and graduate students in entomology and educational outreach, continue to improve our website, and educate the public about insects, spiders and their relatives." Bohart Museum membership categories include individual ($25), student ($15), student families ($25), family ($40), patron ($100) and additional donations. Checks can be made out to the Bohart Museum Society, c/o Bohart Museum of Entomology, Room 1124 Academic Surge Building, One Shields Ave., Davis, CA 95616. There's also a museum BioLegacy sponsorship ($2000 and up) that enables you to name an insect after yourself or a loved one. Calendars. 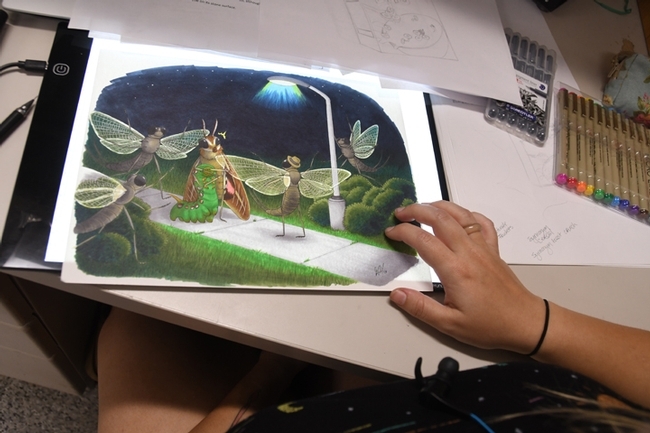 For donations of $50 or more, the Bohart will provide you with its 2019 calendar illustrated by entomology student/artist Karissa Merritt and featuring her humorous interpretations of actual sentences from term papers in Professor Kimsey's classes. Example, regarding mayflies: "The swarmers are attracted to lights and tend to expose themselves in the evenings.” (See illustration below.) It also acknowledges the birthdates of famous entomologists. The calendar is available separately for $12, plus tax. 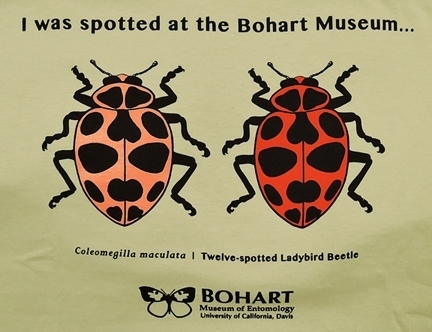 Peruse the Bohart Museum gift shop, which includes insect-themed t-shirts and sweatshirts, graced with everything from monarch butterflies to Hercules beetles to lady beetles (ladybugs) and dragonflies. 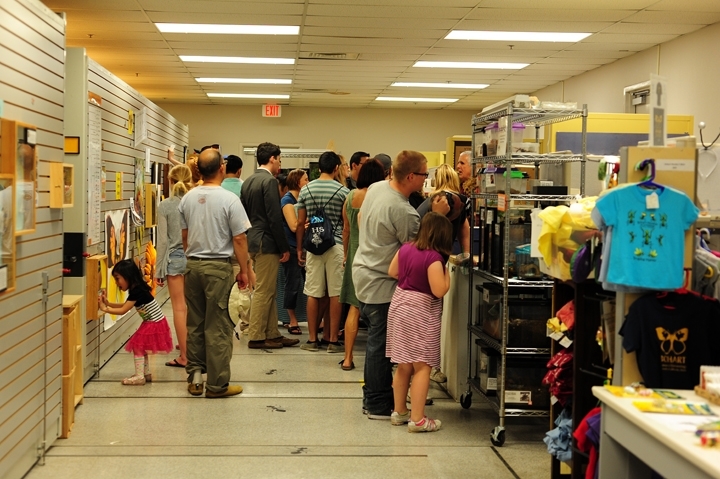 You'll also find in the gift shop: insect-themed books, jewelry, posters and candy, plus insect-collecting equipment. 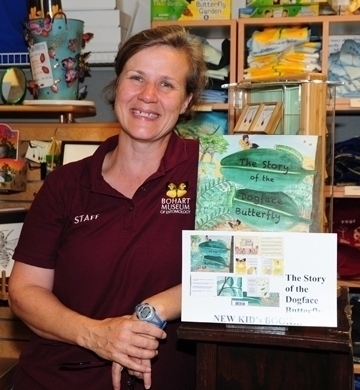 Books in the gift shop include The Story of the Dogface Butterfly, a 35-page children's book authored by Fran Keller, former doctoral student at the Bohart Museum, UC Davis Department of Entomology and Nematology, and now assistant professor at Folsom Lake College. It includes illustrations by former UC Davis student Laine Bauer and photographs by Bohart associate Greg Kareofelas and Keller. The California dogface butterfly is the state insect. Plush toys in the gift shop include tardigrades (much in demand), bedbugs and flies. Posters include the California dogface butterfly, the work of Bohart associates Fran Keller and Greg Kareofelas. Butterfly habitats, zippered and netted, are perfect for rearing monarchs, Gulf Fritillaries and other butterflies. In addition, the Bohart Museum is a good place to see, photograph and hold many of the occupants in its live "petting zoo," which includes Madagascar hissing cockroaches, walking sticks, tarantulas, and praying mantids. The Bohart Museum's regular hours are from 9 a.m. to noon and 1 to 5 p.m. Mondays through Thursdays. It is closed to the public on Fridays, Saturdays and Sundays and on major holidays. Admission is free. For more information, access the website or Facebook page or email bmuseum@ucdavis.edu or telephone (530) 753-0493. They'll give you the shirt off their back. Well, not quite, but you can buy a shirt off their rack! 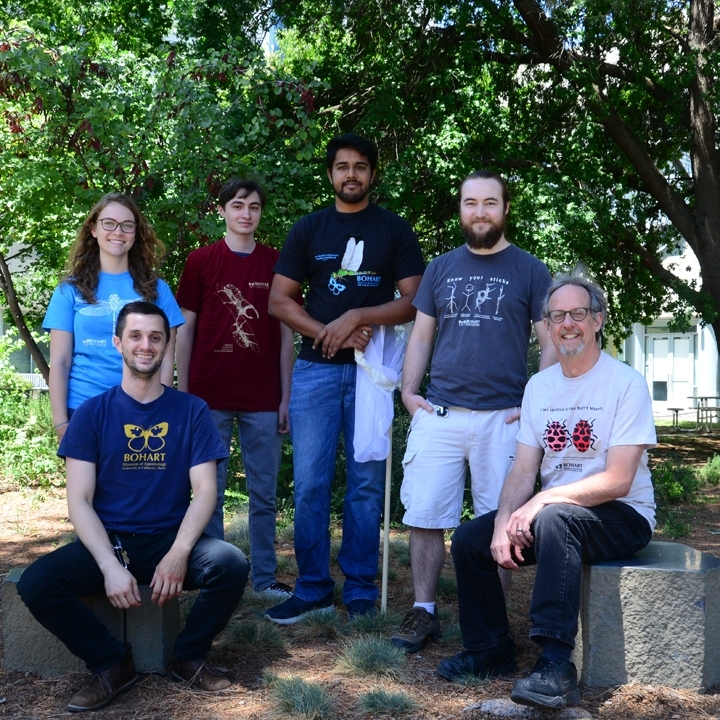 The Bohart Museum of Entomology at the University of California, Davis, has discounted all of its bug-themed t-shirts in its year-around gift shop. "All t-shirts are on sale for $10 each," said Lynn Kimsey, director of the Bohart Museum and professor of entomology at UC Davis. "We're clearing our stock this month." You'll find t-shirts featuring monarch butterflies, California dogface butterflies, dragonflies, lady beetles (aka lady bugs), rhinocerous beetles and stick insects (walking sticks), to name a few. The sizes range from infants to youth to adults. The dogface butterfly, Zerene eurydice, is the California state insect. "They're all $10," Kimsey said. The Bohart Museum accepts credit cards. The sale ends in May. And speaking of the dogface butterfly, you can also purchase a poster and a book in the gift shop. Bohart associates Greg Kareofelas and Fran Keller and former UC Davis student Laine Bauer, teamed to publish a 35-page children's book, The Story of the Dogface Butterfly. The trio visited the Auburn site for their research, and Kareofelas also reared and photographed a dogface butterfly at his home in Davis. 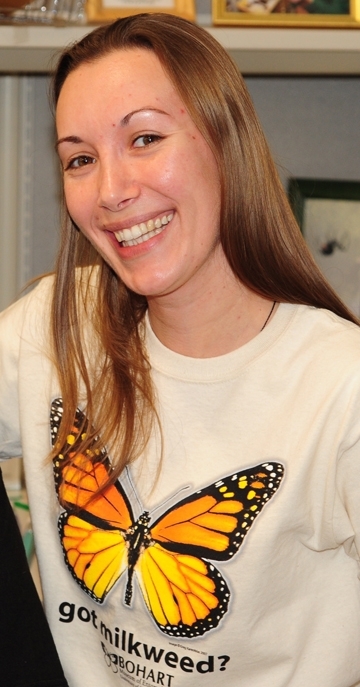 The author, Fran Keller, an entomologist who received her doctorate in entomology from UC Davis, studying with major professor Kimsey, is now an assistant professor at Folsom Lake College. Both Kareofelas provided photos for the book, and Bauer, the drawings, including depictions of the life cycle of the butterfly reared by Kareofelas. The dogface butterfly poster is the work of Kareofelas and Keller. The Bohart Museum of Entomology is located in Room 1124 of the Academic Surge Building on Crocker Lane. 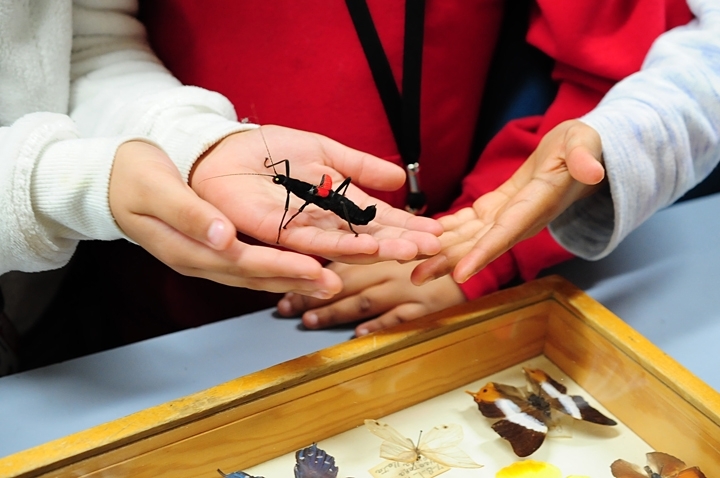 A world-renowned insect museum, it houses a global collection of nearly eight million specimens. It also maintains a live “petting zoo,” featuring walking sticks, Madagascar hissing cockroaches, praying mantids, and tarantulas. A gift shop, open year around, offers T-shirts, sweatshirts, books, jewelry, posters, insect-collecting equipment and insect-themed candy. For more information, contact the bmuseum@ucdavis.edu or (530) 753-0493 access the website or Facebook page. Take a look at the group photo below. Can you spot the praying mantis? Can you see a silkworm moth caterpillar? They're there. And also in a larger format. 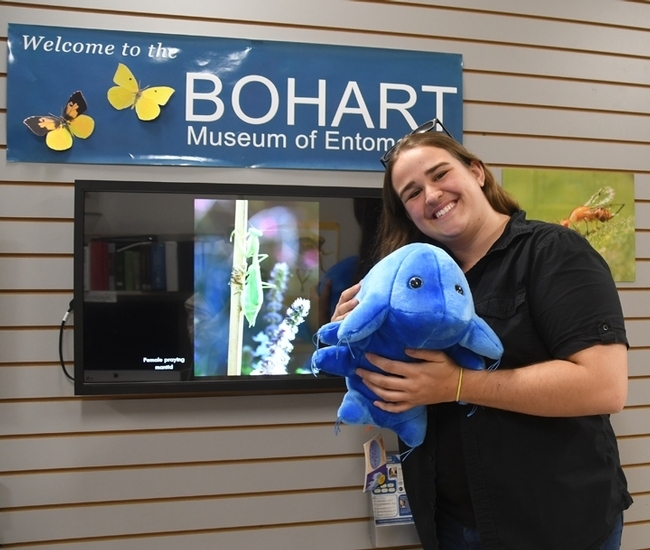 Folks are asking how to donate to the Bohart Museum of Entomology, the world-renowned insect museum that's part of the UC Davis Department of Entomology and Nematology. There's a donate button on its website. All gifts are tax-deductible. The Bohart Museum, home of nearly eight million insect specimens from around the world, also has a year-around gift shop (think t-shirts, posters, books, jewelry and insect-collecting equipment) and a live "petting zoo," consisting of about 200 critters, ranging from Madagascar hissing cockroaches to tarantulas to walking sticks. We identify more than 1000 unknown insects each year, guiding consumers to appropriate and cost-effective control strategies when needed. $1000 donation: This supports an undergraduate student working in the museum for one quarter. With tuition and fees increasing, students need paying jobs. Working in the museum alongside scientists, and learning about insects can be a life-changing experience. 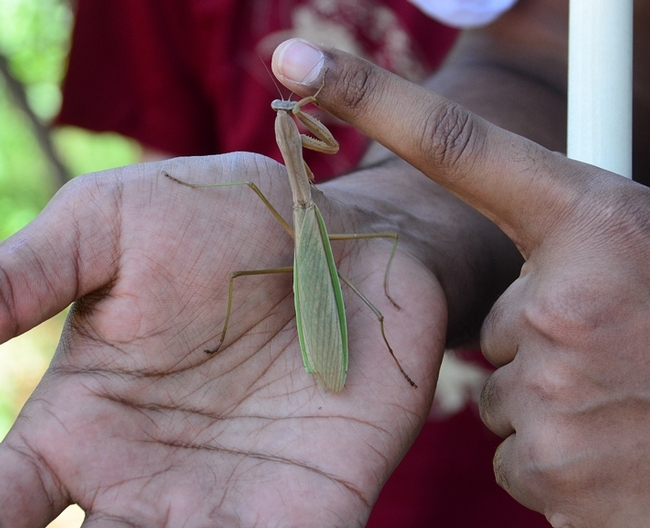 Through donations, the Bohart can better serve the community "and you (donor) may even inspire a new bug lover!" Kimsey says. Folks can also join the Bohart Museum Society; membership has its privileges. In addition, newly discovered insects can be named for a loved one. For more information and details, contact (530) 752-0493 or bmuseum@ucdavis.edu. C’mon, you know you want one. Who wouldn’t want a horror skull stress ball to relieve the tension of today's world? Here's what you do. Take one stress ball. Place it in the palm of your hand and squeeze. From the eyeball socket pops out a membrane of assorted bugs. Or worms, frogs, rats or centipedes. It’s definitely a conversation piece, and it’s yours for only $7 in the Bohart Museum of Entomology gift shop at the University of California, Davis. Proceeds benefit the Bohart’s educational outreach program. 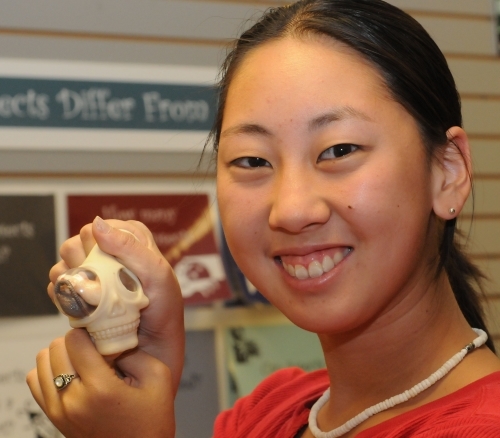 If the skull stress ball doesn’t sound like your main squeeze, try the ant candy, larvettes and crick-ettes. 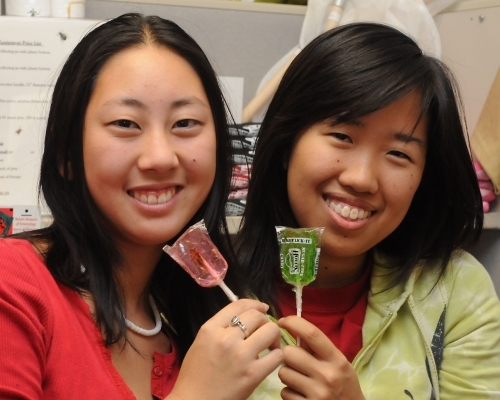 Lollipops appropriately named “Cricket-Lick It” are a new item and they're sugar free, just what the dentist ordered. Butterfly candy is also new. 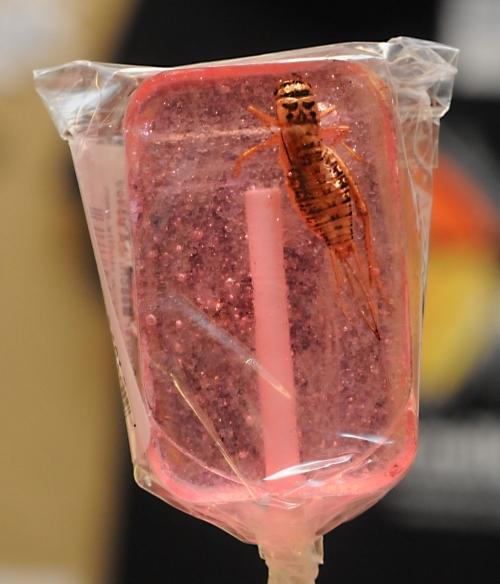 "We sell insects to eat as candy or sweet treats and people are amazed that you can actually eat insects," said Fran Keller, a doctoral candidate in entomology who's based at the Bohart. Among the other items available in the gift shop (both online and at the museum) are dragonfly and monarch butterfly t-shirts, insect posters, magnets, and insect collecting nets. 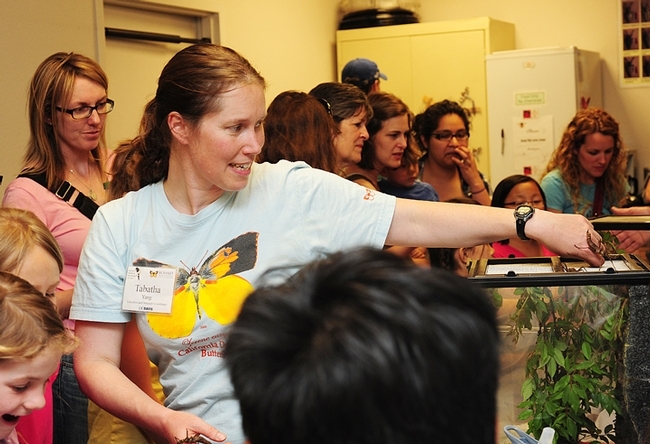 The Bohart Museum of Entomology, founded in 1946 and today located at 1124 Academic Surge on the UC Davis,. houses some seven million specimens from around the world. In fact, its collection is the seventh largest in North America. Besides the specimens, the Bohart also showcases live critters, including Madagascar hissing cockroaches, walking sticks, tarantulas (including a rose hair) and a fiesty black Brazilian spider that's just moulted. 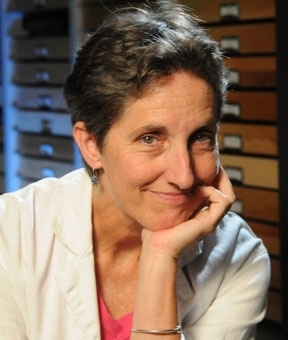 The museum, directed by Lynn Kimsey--who also chairs the Department of Entomology--is dedicated to teaching, research and service. Its focus: terrestrial and fresh water invertebrates. The museum is also the home of the California Insect Survey, a storehouse of the insect biodiversity of California’s deserts, mountains, coast and great central valley. The Bohart Museum is open between 9 a.m. and 5 p.m., Mondays through Thursdays. Educational outreach program coordinator Brian Turner arranges the group tours. For more information telephone Turner at (530) 752-0493 or e-mail the museum at bmuseum@ucdavis.edu.